In front of a friendly crowd at the Las Vegas Convention Center, President Donald Trump, who flew out to show support for Republican Sen. Dean Heller, said that his Supreme Court nominee "is going to be just fine." Judge Brett Kavanaugh, Trump's pick to succeed Anthony Kennedy, has denied an accusation by Christine Blasey Ford that he sexually assaulted her when they were teenagers. "You know," Trump said, "one of the reasons I was elected was because you believed that I was going to pick great Supreme Court justices." "Brett Kavanaugh -- and I'm not saying anything about anybody else -- but I want to tell you that Brett Kavanaugh is one of the finest human beings you will ever have the privilege of knowing or meeting," the president added. "A great intellect, a great gentleman, an impeccable reputation, went to Yale Law School, top student, so we have to let it play out, but I want to tell you, he is a fine, fine person." Trump added: "So we will let it play out, and I think everything is going to be just fine." The president was in Sin City to help support Heller in a contentious, high-profile, high-dollar Senate race. Heller is up against Democrat Jacky Rosen. For Heller, it's a bit of a gamble to stick with Trump. In 2016, Hillary Clinton won the Silver State, and Heller has only recently warmed to the president. "We started out -- I didn't like him, he didn't like me," Trump said. "And as we fought and fought and fought, believe it or not, we started to respect each other, then we started to like each other, then we started to love each other." 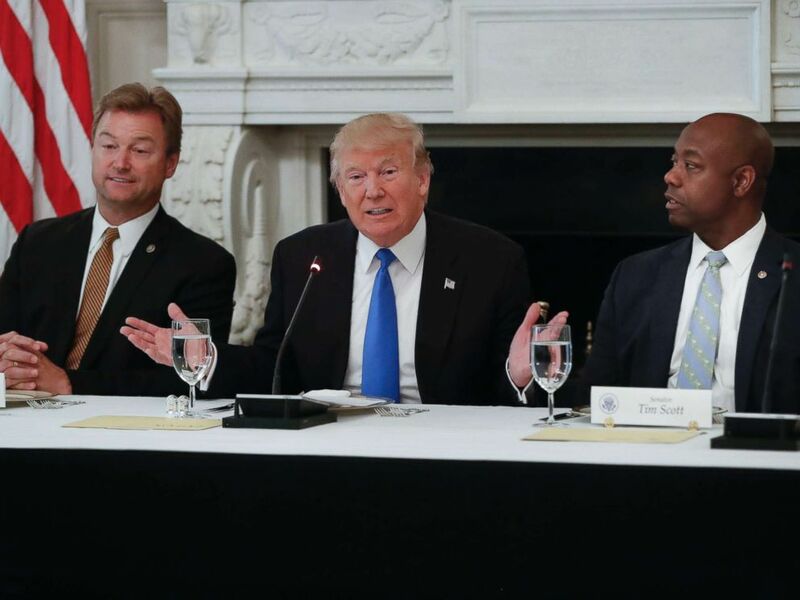 President Donald Trump, flanked by Sen. Dean Heller, R-Nev., left, and Sen. Tim Scott, R-S.C.,speaks at a luncheon with GOP leadership, July 19, 2017, in the State Dining Room of the White House in Washington. Trump slammed Rosen as "Wacky Jacky," and rattled off her voting record, claiming that the Democrats' new platform is "radical socialism" and "open borders." "I don't want the United States of America to become the next Venezuela," Trump continued, to loud chants of "Build the wall!" He mentioned Hillary Clinton, to loud chants of "Lock her up!" Trump blamed the country's woes on Democrats. "I'm angry at Democrats because of what they do to our country," he said. "Today's Democratic party is held hostage by left-wing haters, angry mobs, socialist fanatics, deep-state bureaucrats and their fake-news allies. "Except for a lot of the fake news that you see from these people back here, this is an incredible time for our country. America is winning again. America is being respected again."